According to its website, The Egg provides seating for 500 students with an additional 50 seats available outdoors. This on-campus eatery has made efforts to increase their use of vegetables and fruits in their dishes as to develop dishes where “meat plays more of a supporting role” while increasing the usage of whole grains, creating masterful menus that seek to promote health and sustainability. Photo by Sage Higgins. The Culinary Institute of America sits right across the Hudson River, offering up some tasty meals made by faculty and students alike. Sage Higgins is here to give us the scoop. In the land of houndstooth pants and white chef coats sits the Culinary Institute of America (CIA) in Hyde Park — an eating experience I recommend to anyone in the Hudson Valley. But more specifically, The Egg, an on-campus eatery, supplies the students and the community alike with a savory, sweet, and most importantly, delicious menu that is always changing. The Egg sits right on the Hudson River which supplies consumers with a beautiful view while they enjoy their food and beverages. I had the pleasure of speaking with executive chef Mike Smith, who gave me the ultimate behind-the-scenes look at The Egg. Smith explained that there are several different stations that make up The Egg. Many of these act as classrooms for students of the CIA. The three classroom components at The Egg are the Innovative Kitchen, the Line and the Brooklyn Brewery. Up next is the Innovative Kitchen: a key aspect in the full education process of experiencing the hands-on world of food. The Line is fully staffed by students, with a menu cycled every three weeks and based on the seasons. This section of the Egg is open Monday to Friday serving lunch and dinner when class is in session. Always a weekender at The Egg, I decided to try a few new things from the Line, which operates on weekdays. I tried two dishes both priced separately under $10: sautéed beef cutlets with roasted brussel sprouts followed by the “Health Mac and Cheese with Seitan.” The sauce that accompanied the beef when combined with the brussel sprouts was a heavenly combo. The dish gave me a warm, filling feeling as if I were eating a classic holiday meal, but with a modern twist. 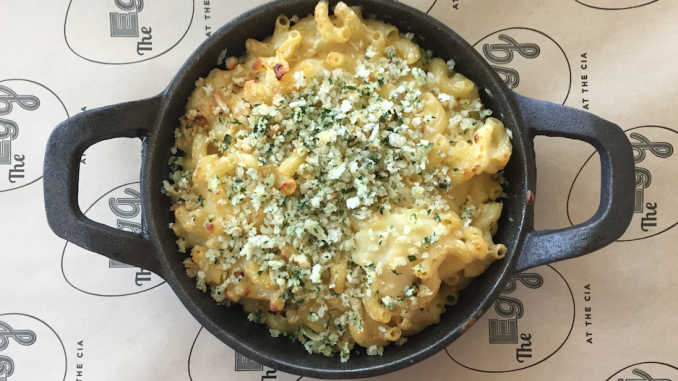 As for the second dish, I’m always a fan of a good mac and cheese — and this was no exception. I was given a generous portion that was both satisfying because of its comfort-food-like nature as well as its health-consciousness. Who can argue with healthy mac and cheese? Though the taste of the food is a crucial element of the dining experience, another is the hospitality. Smith made the dining experience at the Egg truly exceptional through his kind and generous nature. The energy and excitement he has for the Egg truly shines through how the Egg operates on a daily basis. The Egg is located on the CIA campus and is open seven days a week from 11 a.m. to 11 p.m. Check out their mouthwatering treats on Instagram at @theeggatthecia.